Social Influence is not a new phenomenon but the searches for influencer marketing have risen 5X over the past few years according to Google Trends. The underpinning reason is that we are all more connected than ever with the advent of social media platform like Facebook, Instagram, Twitter and Youtube. It's where we go for news and updates from friends and family, where consumers discover new solutions or go for advice. The core of social media network, the trusted inner circle reside social media influencers. These are social media stars who their followers spire to, from fashion, beauty to travel. Social Media Influencer marketing is a trend on the rise as more and more businesses are turning towards social media personalities to create and produce branded content. It's a win-win where brands seek access to highly engaged niche audiences and social media influencers seek a value exchange that provides VIP treatment and monetary rewards. Brands gain a human touch for delivering their brand message and social media influencers garner exposure and building up their personal brand. Why Social Media Influencer Marketing? 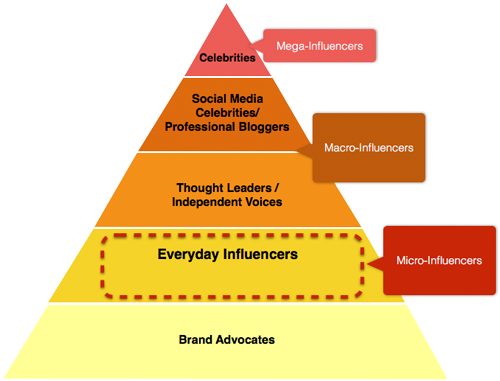 What Should You Use Social Media Influencer Marketing For? According to a survey from Adweek, 92% of today’s consumers trust recommendations from others over branded content. With influencer marketing, brands can reach millions of consumers through the voices of people they trust the most - their peers. You can activate hundreds of influencers who then create thousands of pieces of original creative content about your product or brand and share them across multiple social networks, increasing awareness through stories versus the paid static banner ads. When you work with influencers, engagement happens naturally as a result of the meaningful relationship influencers already have with their audiences. Consumers are more likely to engage directly with your brand or product if they’re introduced to it by someone they trust rather than through brand-created content. Influencer marketing has also proven itself to be a reliable tactic for generating inbound traffic especially if it is an evergreen long-form content, such as a blog post. This type of content will continue to surface in search results and drive traffic to your site long after the conclusion of your influencer marketing campaign. It is quite common for brands to tap into Influencer marketing to grow their email list. You can offer a sweepstakes entry, newsletter sign-ups, or coupon downloads and ask your influencers to promote the contest or event to their fans. Want to see an increase in sales? Influencer marketing can be very effective at driving sales if you do it right. It's about working with the right influencers to produce the right content that map your customer journey. Awareness – Influencers extend your reach to their loyal audience base. Consideration – Influencers spark higher engagement online and increase the amount of qualified leads flowing into your sales funnel. Decision – Through product reviews and recommendations, influencers drive conversion and increase sales. 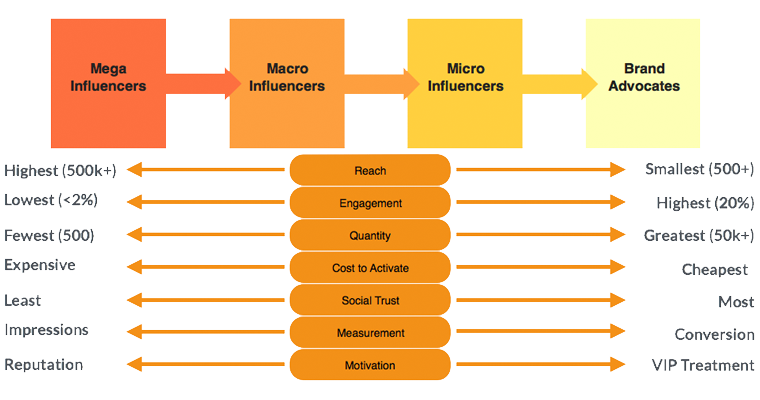 Adoption – Influencers create positive brand sentiment as a trusted source to their following. Advocacy – Through digital word-of-mouth, influencers inspire their followers to share your brand’s content. Why Is Social Media Influencer Marketing More Effective than Traditional Advertising? Research shows that influencer marketing can sway the opinions of today’s consumers more effectively than traditional advertising. According to Nielsen, recommendations from people consistently tops the trust rankings across all generations, beating out branded websites, TV ads, newspaper ads, and editorial content. Influencer marketing programs deliver significantly more value than display ad campaigns and can even make your social advertising more effective. Each influencer marketing program provides the brand with original content and lifetime value. The influencer content will continue to be discovered through search and social sharing over time. To combat ad blocking, many brands are turning to influencer marketing as an effective alternative. Influencer created content can’t be blocked and is inherently different from digital display ads in that it provides entertainment or informational value as part of an authentic story. Because the content comes from a trusted source, consumers are significantly more likely to engage with the sponsored content rather than quickly clicking to exit.